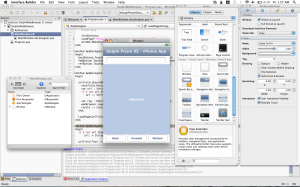 One of cool features in Delphi Prism XE is the support for iPhone Development using MonoDevelop IDE and MonoTouch, since you already know Delphi language it helps you to jump on iPhone world, another cool feature is the ability to build Moonlight applications (the Mono alternative to Silverlight). 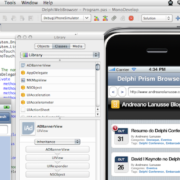 MonoDevelop IDE integrated with Delphi Prism to create and manage our projects. Interface Builder allows developers to create interfaces for applications using a graphical user interface. Both IDE’s are very easy to use and reusing our knowledge in Delphi language plus the new features of Delphi Prism language helps a lot. For every new platform is important to understand how it works, with iPhone is not different and I high recommend you to understand first the MVC concept and the iPhone Platform. Today I was working on some samples and I took two screenshots showing the MonoDevelop IDE and Interface Builder, the second one shows my simple web browser built in Delphi Prism XE. Next week, here in San Jose, CA we have the DelphiLive, our Delphi Conference where you will have the opportunity to meet and talk face to face with other Delphi developers, as well you will meet the Delphi team and improve your skills. My session “Building managed-code cross platform applications with Delphi Prism” on DelphiLive will demonstrate how you can start developing iPhone applications and how to develop web applications using ASP.NET and deploy on Linux. I forgot to add an important information about the requirements to build iPhone apps with Delphi Prism, in order to deploy apps to the Apple iPhone AppStore users will need to obtain a MonoTouch deployment license from Novell, join the Apple Developer program, and must adhere to Apple’s iPhone developer license terms. While Apple so far is passing MonoTouch applications, including games built with the Unity Framework, we cannot guarantee that Apple will pass MonoTouch developed applications in the AppStore. Today Apple announced to “relax all restrictions on the development tools used to create iOS apps, as long as the resulting apps do not download any code”. For sure there are lot of question about this topic. 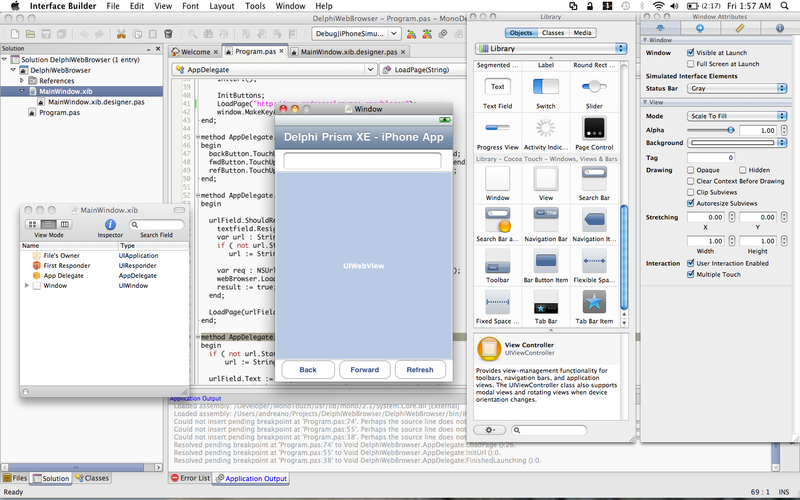 I will blog more about iPhone Development with Delphi Prism in the future. Is this allowed by the SDK license? Or the ban about application not written in C/C++/Objective-C and using an intermediate framework has been lifted? This does look cool.. Actually it’s been possible for close to a year now to do this, but I would recomend to install the iPhone SDK, and use Xcode all the way through. Sure, the syntax is slightly different from Pascal (it looks absolutely nothing like it), but its not that hard to get used to.. 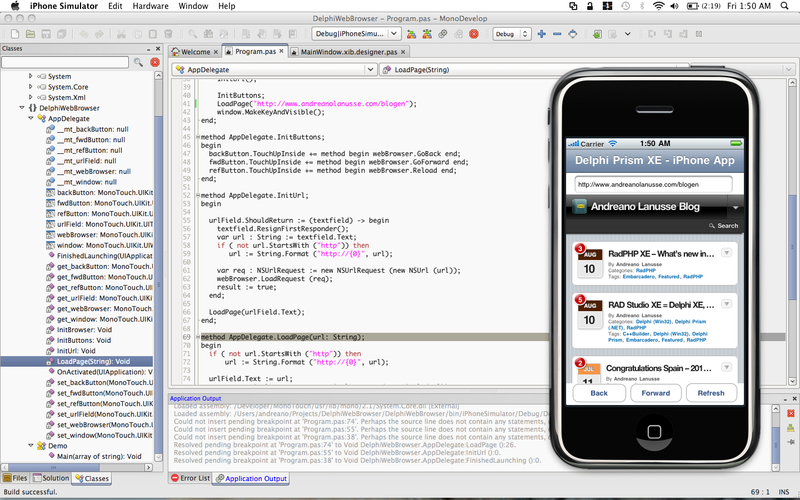 I would even look at the SDK’s from RemObjects Software as to make some cool iPhone apps.. I think Apple is currently allowing such applications into the store but they won’t say a word about it officially. The problem is as long as the license isn’t change writing applications that way one has a sword of Damocle upon his head. Apple can allow them now and remove them whenever it likes. Probably they aren’t enforcing it too much now they kept flash away to avoid antitrust regulators look into it, but they can always use it against you whenever they like. That’s not the way we like to do business – if a license forbids something we avoid it. Hi Jens, officially we lunch iPhone support in July, what you saw before was beta. About iPhone SDK license, so far Apple allow the deployment of apps based on MonoTouch. I forgot to add this info in my original post, I updated to reflect that. could you please name a couple of apps that have been written with MonoTouch that are in the AppStore or name the source that justifies the statement “so far Apple allow the deployment of apps based on MonoTouch”. Nã consigo entrar em contato contigo pelo link do site (Contact). Como faço? Hi, is there some place that we can download these samples. I’m a delphi win32 programmer trying to figure out iphone apps with Delphi Prism XE and I’m lost. The inteface builder gives me a headache. I’m trying to do a pretty simple web browser app. I missed your talk at code rage and I can’t wait for it to be online. On the same post there is a video replay of this presentation. I am with Ray. I am originally a win32 programmer and going to Delphi .NET is very intimidating. I hope people like Lanusse post more sample code and demo of their delphi prism xe developments online for beginner like me. Thank you Andreano Lanusse. I am very interested in developing iPhone apps using my language of choice, Delphi. I understand that Delphi Prism XE with Monotouch allows this, but my question concerns whether this has to be done on a Mac. I have a Windows-Vista PC, and would really like to be able to create the iPhone apps on that machine rather than buying a Mac. Is such development under Windows even possible? Bill, you need a Mac for iOS development. 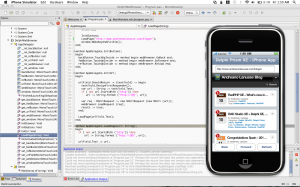 In FireMonkey you will be able to develop on Windows, but will need to compile on Mac. Stephan, in order to create iPad apps you will need to redesign your application, VCL doesn’t support iPad. The business logic can be reused in FireMonkey, but you will need a new UI.